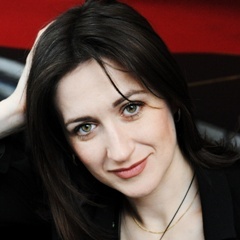 Recent engagements of the Russian soprano Irina Oknina include Yaroslavna in concert performances of Prince Igor at the Gewandhaus Leipzig and her debut at the Teatro Colòn Buenos Aires as Zemfira in Aleko and in the title role in Rachmaninov’s Francesca da Rimini (a role she also sang in concert in Darmstadt in the 2014/15 season together with Sergei Leiferkus), as well as Leonora in Il trovatore at the Vienna Volksoper and Violetta in Düsseldorf. In December 2012 she made her debut as Aida at the opera house in Regensburg. In 2015 she made her debut as Nastassja Filippowna in Mieczyslaw Weinberg’s Der Idiot in Oldenburg. Future highlights include Amelia in Un Ballo in Maschera in Magdeburg and Judith in Bluebeard’s Castle in Metz. The concert Big Voices of Tomorrow with the Russian National Orchestra conducted by Mstislav Rostropovich at Frankfurt’s Alte Oper, provided Irina Oknina with an occasion that led to her engagement as a company member of the Bonn Opera. Until 2013 she remained connected to this house, where she has sung mostly the leading roles from the Italian repertoire, such as Desdemona, Amelia in Un ballo in maschera, Leonora in Il trovatore and Adriana Lecouvreur, as well as Tatjana in Yevgeny Onegin, Lisa in Pikovaya dama, Rusalka, the title role in Káta Kabanová and she also had a great success as Violetta in La Traviata, a role which she has frequently sung at the Leipzig Opera. At Essen’s Aalto Theater she sang performances of Mimi. After first studying to be a choral conductor, Irina Oknina changed direction, studying voice and acting at Moscow’s University of Arts from 1994-99. First engagements took her to the Na Basmannoy Theatre in Moscow and the Galina Vischnevskaja Opera Center, where she completed her education taking master classes with Mstislav Rostropovich, Zubin Mehta and Ernst Haefliger.